Missouri’s blue skies were once among the busiest in the nation. In 2000, a combined 21 million people boarded planes at Missouri’s two cross-state international airports. At the time, air travel was relatively easy and convenient. And with global access from St. Louis and Kansas City, Missourians were just a flight away from much of the world. But then dark clouds began to gather. The 9/11 terrorist attacks brought new security hassles. Then came major airline consolidations, hub closures, and, finally, the prolonged economic recession. All told, Missouri’s airports have endured a decade-long storm. It’s more than a metaphor. Mother Nature even got in on the pummeling, sending a violent EF4 tornado into St. Louis’s main terminal in April 2011. In the wake of all this, the number of air travelers boarding planes in St. Louis and Kansas City has dropped by nearly half since 2000, largely due to passenger decline in St. Louis. Although there’s been a rebound in recent years, the earlier passenger volume is likely never coming back. However, despite these challenges, airport leaders in both cities say that their facilities are on the verge of a rebirth. 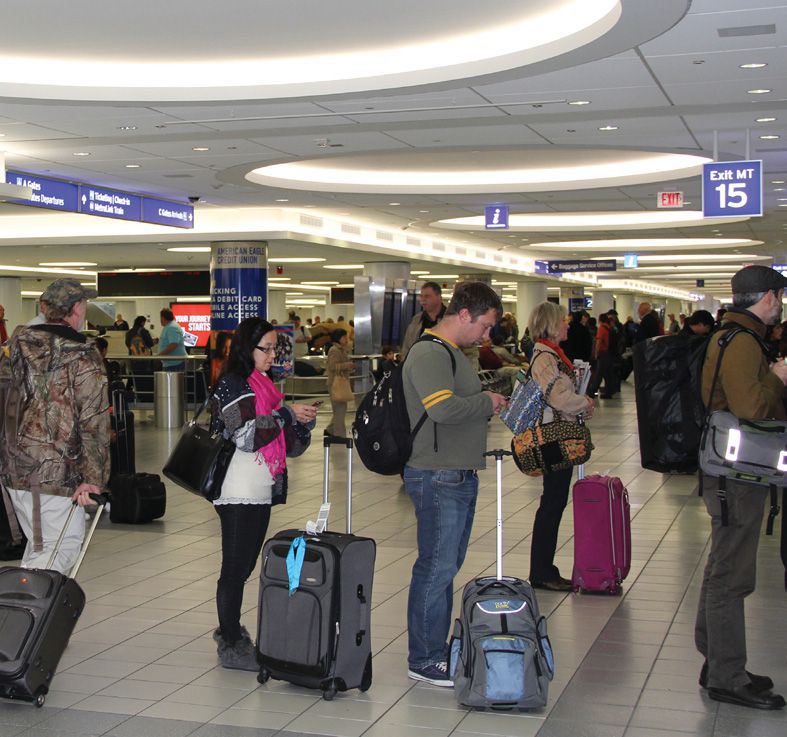 Although neither airport is among the nation’s elite for passenger traffic—St. Louis ranks 31st and Kansas City is 34th—airport leaders today envision a different future. Courtesy of Kansas City International Airport. They foresee their airports as becoming homes to major new industrial developments, such as international trade depots and cargo hubs. At both airports, the transformation has begun. There are early signs of progress. “We see a lot happening here that’s not really related to the airlines themselves,” says Mark VanLoh, director of aviation for the Kansas City International Airport. The outlook is similar in St. Louis. “We haven’t given up on passenger business, but there are other facets that can bring phenomenal revenue into our airport, which can make us more cost effective and competitive,” says Rhonda Hamm-Niebruegge, director of airports and chief executive officer at Lambert-St. Louis International Airport. With new ideas and new support, both airports say things are starting to look up. Big changes are underway at Kansas City International, but they’re likely invisible to the travelers who pass through the airport’s two active terminals each day. 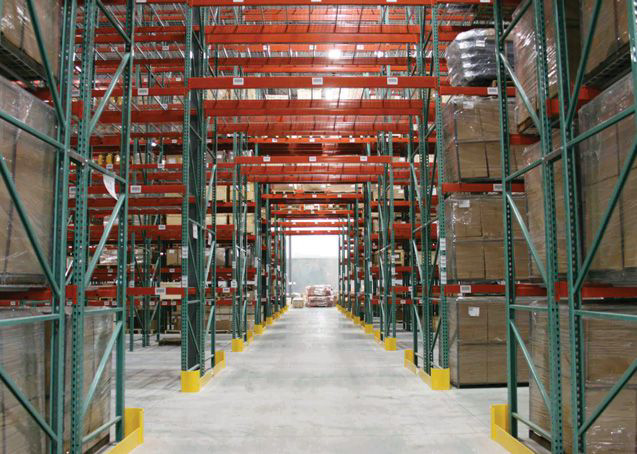 Over the past few years, two giant warehouses have been constructed on the airport’s massive property—more than 10,000 acres located north of the city. Blount International. Photo by Kathleen Hefner. Today, one of these warehouses is home to a distribution center for Blount International, a Portland-based outdoor power tool parts and products manufacturer. The second warehouse, which is still under construction, will be home to an Aviation Technical Services aircraft maintenance facility. Together, the two developments are expected to create more than 800 new jobs in Kansas City. 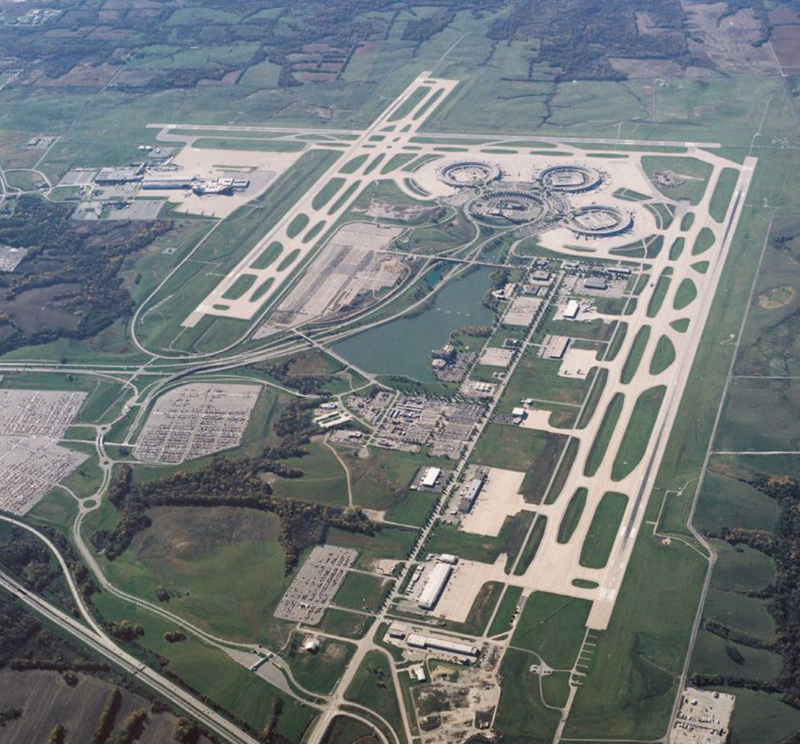 They exemplify the potential that state and local economic development leaders see in the broad tracts of underdeveloped property surrounding Missouri’s major airports. VanLoh says there are a number of industries where manufacturers value having locations near airports: pharmaceuticals, computer parts, high-end jewelry, and others. These companies benefit from being able to create products and then immediately disperse them across the country. “Typically at an airport, you see companies that need to put products on an airplane at the very last minute,” VanLoh says. Missouri’s focus on airport-based development mirrors other efforts nationwide. Kevin Burke, president and CEO of the Airports Council International-North America, notes that airports in the United States support about 10.5 million jobs and account for $1.2 trillion, or 8 percent, of our nation’s gross national product. In Kansas City, VanLoh says city leaders have been vying for economic development at the airport for years; both Kansas City International and Lambert-St. Louis International are municipally owned facilities operated by city employees. The development effort started when the city took out an advertisement in The Wall Street Journal seeking a consultant to help develop the airport property. That led to an agreement with Dallas-based developer Trammell Crow, which drew up a multi-stage plan for building business at the airport. With the new warehouses and hundreds of jobs being created, the plan is starting to come to fruition. In St. Louis, airport and economic development leaders have made national headlines in recent years for their efforts to land high profile economic development projects. The airport was heavily involved in the state’s work last year to entice Boeing to build its 777-passenger jet in St. Louis—a $10 billion project. Although Missouri didn’t land the project, news reports indicate St. Louis came in a close second. Earlier, state and local leaders established the Midwest Cargo Hub Commission, which worked for years to woo the Chinese and other international markets to establish a cargo base at Lambert. After several rounds of visits between St. Louis and Chinese leaders, the project was successful in landing Chinese cargo planes in St. Louis. However, the project was short-lived because state lawmakers couldn’t pass tax incentives to help fill the planes with goods going back to China. The Chinese cargo shipments ended soon after they started. Courtesy of St. Louis International Airport. Despite the setbacks, airport leaders believe that aiming high has drawn positive attention to all that Lambert can offer. Even though these two headline-grabbing projects didn’t reach full potential, the airport has been working on other initiatives that could be transformative. The airport wants to help farmers across the Midwest ship livestock internationally. There is an increasing demand for shipments of live animals to India and other Asian nations. To do this, the airport is progressing toward developing a USDA Resting & Processing Facility in the region to attract animal shipments. “It’s a growing business, and we want to take advantage of that,” Hamm-Niebruegge says of shipping livestock abroad. Another project involves creating a dual customs facility at the airport with Mexico. At this facility, products manufactured in the United States that are destined for Mexico could undergo all customs procedures prior to departure. For imported Mexican goods, St. Louis is ideal for distribution due to Lambert’s proximity to highway, rail, or water shipping routes. Like Kansas City, St. Louis would also like to have a developer come in and sign an agreement to bring business to the airport. But in the meantime, the airport continues to think big and is always working on the next opportunity. “As a result of our efforts, we’ve risen to the top of the list for site locators,” Hamm-Niebruegge says. Even as St. Louis and Kansas City airport leaders have their sights set on economic development opportunities, they also work to serve their regional business communities by offering improved flight selections. Both airports are seeking input from regional businesses to ensure their flight offerings reflect the needs of the business people in their areas. 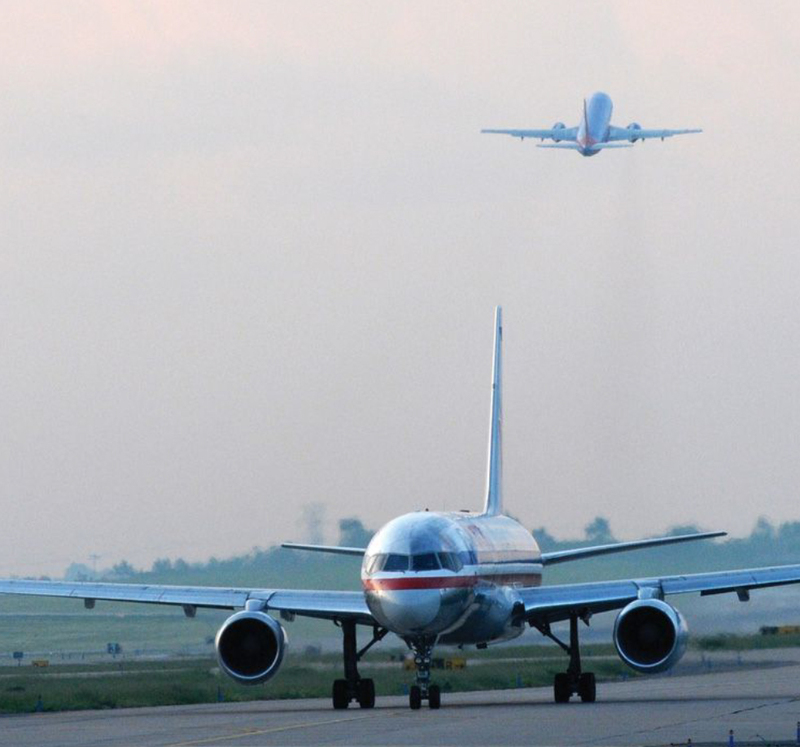 In St. Louis, the airport has been steadily regaining the flights lost when American Airlines closed its hub there in 2010. As they rebuilt their flight schedule, airport leaders sought to add flights from a variety of carriers, making them less tied to the fortunes of a single airline. One example of this success is the airport’s growing relationship with Alaska Airlines. Alaska first came to Lambert in 2011, establishing a direct flight to Seattle—a critical link to the Boeing headquarters. Working with a variety of carriers has been a successful strategy to help bring more flights to St. Louis. In Kansas City, VanLoh is having similar discussions about expansion. With the growing tech startup culture, he says the city needs a direct link to Silicon Valley. 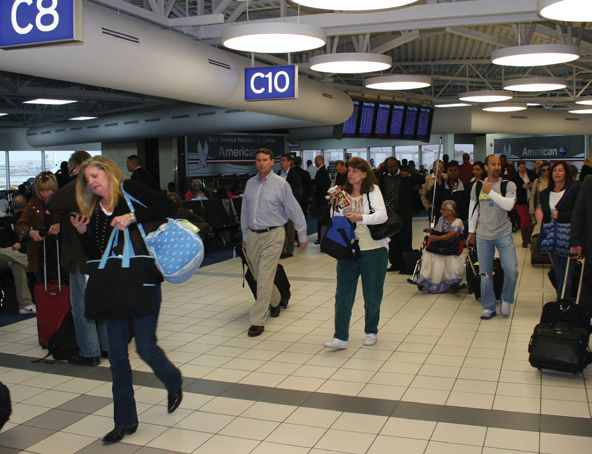 Leaders in both cities are also working to enhance the airport experience for travelers. The St. Louis airport has nearly completed a $70-million project to put a new face on its historic Terminal 1. Construction on the project started in 2008. Workers are just now wrapping up the interior projects: new lighting, new signs, bathrooms, and terrazzo flooring in a fully renovated ticketing lobby. Project designers made it a point to have the new Lambert better reflect the city of St. Louis. There are new displays and artwork highlighting local attractions and landmarks. The airport also has a new in-line baggage screening system, making it more convenient to check luggage. Travelers who haven’t been to St. Louis in several years are often taken aback by the improvements. One project she is excited about is a new play area designed to improve the flying experience for children and families. It was built in conjunction with the local children’s museum The Magic House. Airport leaders say families can expect a world-class play area. The changes are even visible outside Lambert, where workers are removing the old copper roof, which is past its life expectancy and prone to leaks, and replacing it with new copper. In Kansas City, a panel recently recommended that the city construct a new single terminal, which would replace the airport’s existing split terminals. The KCI Terminal Advisory Group had studied the issue for a year. Their recommendation means airport leaders can move forward with more planning. If city leaders ultimately go forward with the idea, it will still be years before construction could begin. VanLoh says today’s air travelers also benefit from ever-improving personal technology. Smartphones can store tickets and help passengers navigate to their gates. It’s possible to check in ahead of time with your laptop. These little conveniences are important as airports try to win back millions of travelers who stopped flying after 9/11.